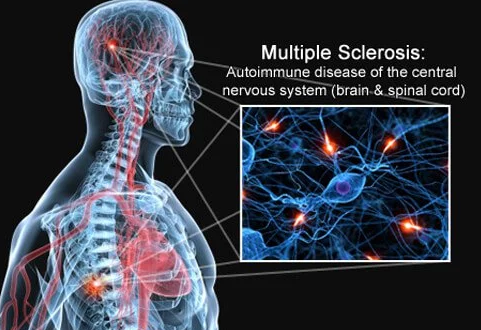 Multiple sclerosis is a disease that disables the nervous system. The immune system destroys myelin (protective sheath above nerve fibers). This leads to communication problems between the brain and the rest of the body. Eventually, the nerves become damaged. Multiple sclerosis has no cure. However, special medication can help manage symptoms and help in quick recovery from attacks. The causes of MS are unknown. It is classified as an autoimmune disorder, whereby the immune system destroys its own tissues. Multiple sclerosis results in the destruction of myelin- a fatty substance that protects the spinal cord and nerve fibers in the brain. When the nerve fibers become exposed, information travelling through them is blocked or slowed down. The delicate nerves may also get damaged due to lack of insulation. It mostly affects people between the ages of 15 and 60 years. Women are more likely to develop MS than men. Family history. If your parents or siblings suffer from MS, then there is a high chance you will develop it too. Some viruses have been connected to this disease. A good example is Epstein-Barr, which causes mononucleosis. White people with a Northern European descent have a higher risk than other races. MS is more prevalent in areas with temperate climates, such as Europe, the northern part of US, Canada, southeastern Australia and New Zealand. Smokers have a high risk of MS than non-smokers. Other autoimmune diseases. There is a slight risk of getting MS if you suffer from type 1 diabetes, inflammatory bowel disease or thyroid disease.